Update Notifier is a small utility that scans your computer for installed software and displays a list of updates. Also you can see the latest updates for applications from your Watch List. Why do I need this software? You can see the status of all of your installed software with direct download links for each one. Does not work. Sumo found 2 programs requiring updates while Update Notifier just sits there. I used FileHippo's update checker for a couple of years when I stumbled on Update Notifier. I have tried it for a couple of months and liked the interface so much I uninstalled FileHippo. However, during the 2 months, I noticed that it never came up with any new updates. So today, I downloaded and installed FileHippo and let it scan for updates. It found 4. One of those was the latest Java RE; the others were minor. My conclusion: Update Notifier misses a number of needed updates. I will probably uninstall it in the next week or so. Finds more updates than the FileHippo.org updater. The only slight annoyance is the download site, which has an unnecessary second page you have to click through to get to the actual download. For the ads, I guess. I think it could be nice to do some Update Notifier forum instead of comment all problems here. Here you have one by techsupportalert: http://www.techsupportal...rum/showthread.php?t=83. This is a great little free and simple to use utility, but what you may not know is that 2 great guys gladly and diligently maintain a great website that contains all of the programs and has lots of great information about all of them. They are very open to suggestions and appreciate of the the user input that also helps adding more software to the site. Cleansofts.org. This software is still portable but now includes an install file to help a user browse to the location that they want to store the program and run it. This was added after a user suggestion. After another user suggestion, the latest release added the ability to display all the programs and versions currently installed on your computer and reports when they are up to date as well. 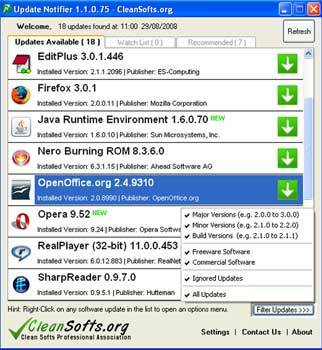 This allows users to submit their installed software for inclusion on the website, thereby being reported in Update Notifier. This is a must have for every computer user of every level of tech knowledge. It's looking good, it found some out of date software on my system and it was very easy to download the updates. Runs fine in Vista x64. Nice little utility. Found some programs I didn't expect to see. I'm not the kind of person that would typically use a too like this, but on a whim I downloaded/installed this. It works great! It found updates to a lot of software I had sitting on my machine, including more obscure programs (Notepad++, Opera, Pidgin, MediaCoder, 7-Zip, etc). Saves me a lot of time having to search for updates myself. Great job guys. Overall, though, this is a helpful utility. It would be nice if it detected updated drivers, but I can understand why they dont--because that's a whole other mess. I recently started using this along with filehippo's Update Checker and find that Update Notifier does find more obscure software and helps keep my system up to date. Not since CNet had their free update checking service has a good viable option appeared. I have to agree, it would be nice to have the application X close the entire app, including the tray icon. Not bad, but for me it's a drawback that it doesn't search for updates to installed software other than programs - drivers, in particular. I agree that closing the main window should also result in exiting the program; and that it shouldn't generate application data which has to be manually deleted if the program itself isn't wanted. Doesn't seem to work at all in x64 Vista. It runs, just doesn't detect anything. We would like to thank you for the feedback, even it's not very positive :). b) exit application vs. tray icon. We'll implement this option in settings. c) ignored versions. We already have the option to ignore/un-ignore (just use the Filters). I'm wondering why you didn't notice the functionality, especially that you seems to have a high experience in software design? It really helps if you manage several pcs specially your family's and you don't have time to search for program updates one by one. The program itself being a standalone exe helps. I carry it in my pendrive.